Hey folks, sorry it’s been a bit quiet around here lately, things are hectic at the moment and I’m still far from 100% fit. Anyway, just thought you’d like to know I got my new Ubuntu powered Dell XPS m1330 and it’s a lovely machine. I would highly recommend it as a powerful ultra-mobile Linux solution. I was intending to do a full review of this system but there isn’t much point at the moment since this machine is faulty. I can report that it was installed with a custom Dell image of Ubuntu 7.10 which includes the dvd-css decoders and LinDVD for DVD playback. I was attempting to tryout this functionality when I realised the drive was broken, good job I did. Using this for a day so has confirmed what a nice machine it is though and I can’t wait to get the fully working one. In truth I don’t use the optical drive much at all but since I paid for it I’d like one that works. Worth checking out if you want a new Linux laptop though, your luck can’t be as bad as mine. In other news: I’m currently running Foresight Linux on the desktop and I hope to have a review of that out before I have to travel for a few days next week. 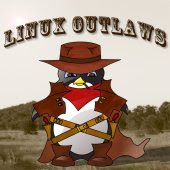 I’ll probably talk about it on Linux Outlaws as well, the weekly podcast I do with my friend Fab. We’re getting quite a few listeners now and it’s really nice to hear people’s feedback. The only reports of DVD reading I’ve found have been on Windows systems. Wow that’s interesting. I remember lots of news about Dell adding DVD decoding to their Ubuntu images before Christmas. Here’s a post from Mark Shuttleworths blog, the founder of Cannonical and Ubuntu. If you’ve tried all this stuff then maybe it doesn’t work, it just seems a little strange that Shuttleworth would so openly say that it does. Strange. Unfortunately I couldn’t get past loading a disc into the machine so it definitely won’t work for me at the moment. Turns out the drive that ships with M1330 has the wrong region mask setting which leads to read errors on Linux. I re-set it using regionset and now it all works perfectly. I have not personally worked on the m1330 before, but from what I’m seeing in the service manual the drive is not considered Customer Removable (it is almost as much work as replacing the motherboard) and will require either sending a tech out to work on the system, or the system to our repair depot (depending on the service option on your warranty). If you haven’t already gotten in touch with tech support to get the drive replaced feel free to let me know and I’ll be happy to have someone from our UK support group get with you about it. Unfortunately, since I am in the US (at Dell headquarters) I don’t have access to the tools required to set things up for UK systems myself. If you have any questions for me I will be happy to answer them. Thank you very much Larry I really appreciate that. It seems I have managed to fix the drive. I worked out that the motor was locked for some reason and I found a way to release it using a screwdriver. Not an advised practice I know but I didn’t put anything into the drive itself or force/damage the machine in any way, I just pressed a release catch and now it reads and writes discs again. I did email Dell Customer Support UK on Friday but I haven’t had a reply yet. There is something I would like to ask, I didn’t receive the remote control with the machine that normally comes with the Windows m1330. Do you know if this has been removed from the Ubuntu model on purpose? If so, why? It works 100% under Ubuntu and even works with plain Debian. I realise you may not have answers to this as you don’t work on the m1330 and it’s not your department. I just thought I would ask. I’m glad to hear you got things working again. I’m also very curious to know what exactly you did, because it could help me help other customers (I’m always looking for fixes that don’t require the customer to wait for someone else). I would have to check the order details to know for sure, but my understanding is that the remote needs to be specifically selected when the order is placed. If you don’t opt-in for it then it isn’t part of the order. I’ll have to check to see whether it is an option for the Ubuntu system, but at this point I don’t see any reason why it would not be. It is possible that it is not an option because not all of the software on the Windows side is available (or have an equivalent) for linux. Lack of full hardware support is one of the reasons Dell only has a limited number of linux systems available, as we don’t want to sell a system that isn’t “fully functional” running the OS it ships with. Its not that I don’t work on the 1330, its just that I haven’t worked on it yet. 😉 My department is kind of an odd-ball “if it’s Dell we work on it” group, since we are tasked with contacting customers on the internet, and either helping them directly or getting them in contact with the people that can best help, depending on the situation. I’ll do some checking and get back to you about the remote. If you have other questions, just let me know. From what I could find, the remote on the m1330 is part of the TV Tuner package. It appears the TV Tuner is not an option for the linux version of the m1330, most likely due to driver and/or software availability, which means the remote is also not included. For similar reasons the Intel wireless card is the only option for the linux m1330, even though it is possible to get the Dell (Broadcom) wireless card to work with a bit of effort. I do have to say though that actually seeing a Dell Customer Advocate come into a blog like this and try to assist you in any way possible sure has raised my respect for the company. It shot up when they offered Linux, now even moreso with personal help like this. @eyes-only – Thank you for the concern, I made it back last night and I will probably need a few days to recover but I didn’t go crazy thankfully 🙂 I also have to agree that it’s great to see a Dell employee replying directly on the blog here, that’s very cool, a credit to the company and of course the individual. @Larry – Thank you for all the information. I’m still not sure exactly how I fixed the problem or how to repeat the operation but I’ll have a proper think and let you know if I come up with anything you could use. As for the remote, I can see why it may not be included without the TV tuner pack but I still think the option of the remote would be nice for Ubuntu customers, it works with all the in-built media functions of Ubuntu. My friend from Germany (and fellow podcaster) ordered an m1330 with no OS and got the remote included along with some nice Creative headphones. generally as nice little package. He uses it fine to watch DVDs and play all kinds of media under Ubuntu. It might be nice if the policy of excluding it from Ubuntu machines could be reviewed, the remote works out of the box and doesn’t require any hacks or tricks. Anyone could use it without any specialist knowledge. I have passed on your feedback about adding the remote for Ubuntu systems. I can’t promise anything, obviously, but I know for sure that customer feedback has made changes before (linux computers from Dell are a very good example). i have an m1210 running fedora and everything works. so i purchased a vista m1330. i replaced the drive with a larger drive and installed ubuntu gutsy gibbon. i was able to find a lindvd package and convert it to a debian package so i can play dvd’s, i just can’t back them up to my laptop so i don’t have to travel with dvd’s in my luggage. now i either have to use my m1210, bring my dvd’s with me, or find a solution. the broadcom (i wanted a 3945 but got a really good deal on this one and i can get an intel mini-card easily) was nothing to write home about unless you’re into depressing letters. always with the disconnecting or not working. i called dell support and they sent me a 3945 the next day and i shipped back the 1490. wireless works perfectly now. dell advocate, what’s the best way to get the Matshita replaced with a different drive? by the way, the remote and biometric reader work great in gutsy. ah ok, disregard my previous post about not being able to back up encrypted dvd’s. it appears i forgot to press enter after selecting ‘y’ when i was installing the dvd libraries. i’m am now able to play dvd’s as well as back them up on the UJ-857G. this is on the m1330 running gutsy gibbon.